The Racer Rowing Society: Calling Alumni: Support Racer Rowing in 2014! Calling Alumni: Support Racer Rowing in 2014! With the approach of spring, excitement mounts and frenzied attention narrows to a laser-beam focus as we Alumni tune to the Twitter feed (@RacerRowing) for updates about Racer Rowing friends and their sprint season exploits. But hey…why resign yourself to just being a poor schlub staring at a smart phone? Rather than getting the play-by-play second hand from the likes of Steve Goeller, Dan Lavit, and yours truly, why not experience the visceral thrill of collegiate rowing first hand? Racer Rowing cordially invites alumni to join them as they compete in the club’s 18th sprint season. Let’s make sure that our friends hear a resounding cheer as they cross the finish lines at each of the four contests in which they will be competing. If you live near one of the host venues or are thinking about traveling to one of the races, please use the Racer Rowing Society Facebook group to rally your friends! Can’t Make It to A Race? You Can Still Support Racer Rowing! For those of you who have not made it back for Homecoming in the past couple of years, the alumni have been succeeded by a remarkable group of student athletes….The commitment that our fellow alumnus, Matt Weaver and Sara Marshall have shown to this group testifies to their caliber as truly outstanding people. 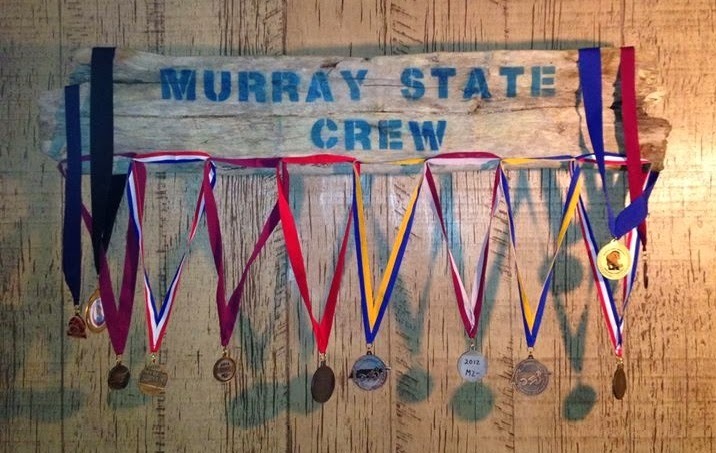 For the most part, members of MSU Crew experience many of the same things that we did back in the good ol' days (e.g., early morning practices on Kenlake, long van rides to races, and getting trounced by Alumni at Homecoming). However, those of us who rowed from 1996-2008 participated on a team that received much more consistent funding. Today, the club has pressing needs for new equipment and facilities. Needs that—despite the earnest efforts of athletes and parents alike—the club has not been able to meet. As Coach Weaver indicated in a post last year, the operating costs for last spring totaled about $20,000. While Racer Rowing has always been able to pay its bills, having the liquidity to invest for the future has proven an enduring challenge. There are far more of us Alumni out there than there are rowers actively involved in the sport. If roughly half of us made a contribution at a giving level appropriate for our own needs, it would have a profound impact on the club’s ability to move forward. So, if you cannot come out to cheer for Racer Rowing in person, please show your support by generously supporting the club with a financial gift. For more details about how you can Support The Crew, click here. Let’s Have A Great Season! Like most of you who stay in the loop, I’m looking forward to seeing how Racer Rowing performs this year. Moreover, I look forward to us pulling together as an Alumni organization; to help Racer Rowing be—financially—the best it can be. Alumni, we’re sitting at the start...oars squared and buried. When the starting gun goes off, are we going to pull the best race we can in terms of giving back to a club that gave each of us so much?